The premise of this book by Julia Rochester is great. 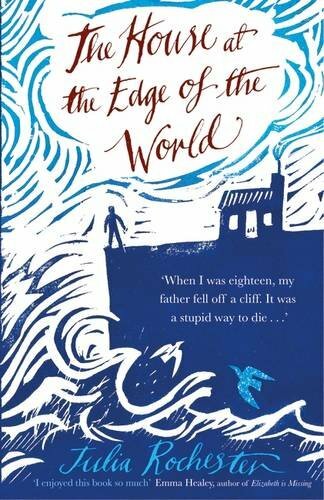 One night, on his way home from the pub, Morwenna and Corwen’s father stops to pee over the cliff edge. And falls. Their lives are never the same again. The house of the title is the Venton family home on the Devon coastline, and this book is imbued with the history of this family, woven together with real family stories, family myths of things that may have happened, and coastal history. The twins’ grandfather, Matthew, is something of a recluse, working on the family history and painting an enormous map of the local area. Cameos of local places, people and events are featured on the map. Again and again, as the twins grow up [they are 18 when the story starts] they each run away to different places. Finally events draw them back to their childhood home, their grandfather and his map, as if drawn by a magnet and still wondering what really happened to their father. I grew up by the seaside, and the town where they live is drawn so clearly the memories flooded back: the beach huts, the seagulls, the cliff top paths, the dropped ice cream cones. Morwenna and Corwen are difficult characters to connect to, but fascinating, and I was drawn into their stories. For the first half of the book, I wasn’t sure where it was going, but then the narrative speeded up and I couldn’t put it down. I had a faint idea of what may happen, but was surprised by the ending which is something that [at the beginning] I thought would never occur. The writing is atmospheric, the details about Morwenna’s book binding were mesmerising. The author doesn’t shy away from writing about the dark thoughts that real people think but don’t admit to, and this adds depth to an intriguing ‘what if’ story. If you like your characters to be ‘nice’, don’t read this. A fascinating and unusual story. For more about Julia Rochester, click here for her website.